Chop onion. Mince garlic. Chop tomatoes. Shred basil. Crumble feta. Slice olives. Put pasta on to boil (cook as per directions on packet), usually 8-12 minutes depending on size. Brown onion, add tomatoes, garlic, tomato paste and red wine, cook 2 minutes. Add peeled/de-veined green prawns and cook further 2 minutes. Add crumbled feta, sliced olives and shredded basil. Drain pasta and add to prawn/tomato sauce, stir through. 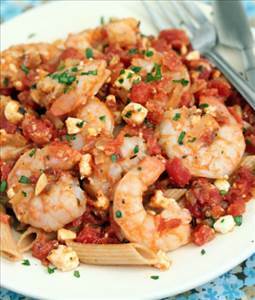 There are 375 calories in 1 serving of Prawns & Feta with Pasta. Calorie Breakdown: 21% fat, 39% carbs, 41% prot.